Unless otherwise noted, pictures are from Cayuga County and the Finger Lakes by Bill Hecht and used with permission. Most have been resized here; a link is provided to the original. 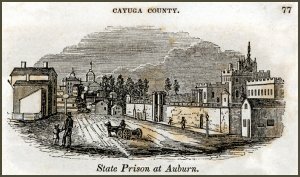 In a history of Auburn, New York, I read that they began building the prison in 1816 and finished in 1819. We do not know how complete the surviving records may be for inmates, but every ten years they are also in the federal census and in 1855, 1865, 1875, 1895, 1905, 1915 and 1925 they would be in the NY State census records. In the 1860 NY State Gazetteer, p. 200, a footnote says there were an average of 700 inmates. Also in Auburn in 1860, there was an Asylum for Lunatic Convicts, built in 1858, with 64 cells, plus rooms for physicians and attendants. Both sites were ten acres large. In mid 2005 I was asked to look up a record for a Samuel Fay, who appears in the 1870 US Census in the Auburn Prison listings, in hopes of finding some additional information about the man. On my first visit to the State Archives in Albany, I asked what records may be available and the staff immediately looked in the computer and told me of the following book, which covers that era: "Convicts Received at Auburn Prison, a register transcribed from old records of the prison, compiled 1877-79." It is supposed to cover the 1870 period, but seemed to mostly be for later in the 1870's and did not list Samuel Fay in the F section. I read thru all of the F surname entries, not finding Samuel Fay... there were only a few sets of F register pages, pp 40-41, 42-43, 44-45, possibly one more set that I did not find any notes on, but none of them were on the man we wanted to read about. There were about twenty men per page, giving the inmate number, date admitted, name and sometimes aliases the man used if known, court where tried, judge of that court, county where the court was held, crime convicted of, length of sentence, place of birth, age, height, race or color, level of education, occupation, whether or not employed when arrested, habits of living (moderate, temporate, intemporate, in other words drinker or not and wild or not), and a note about how or why he was discharged and date of same. #6485, 7-14-1876, William Fay, Sessions court, Judge Hackett, NY County, grand larceny, convicted 5-9-1876, sentence 3 yrs 6 months, born Louisiana, age 29, height 5' 3", white, common education, Steward, not employed when arrested, moderate life, transferred to the asylum 1-10-1878. #6767, 12-16-1876, Frank Fay, Sessions court, Judge Hackett, NY County, assault to harm, convicted 11-13-76, 5 years, born Italy, age 22, 5' 1 3/4", white, no education, laborer, employed when arrested, intemperate, discharged by comm. 6-14-1880. Later, after leaving the archives, i went to the state library and looked at the 1870 census, which did not give any details other than were already known. I also searched the 1865 NY State Census for the inmates, but there was no Samuel Fay, though the names were semi-alphabetic, with all the F names together, but not in alphabetic order. I also looked at the 1875 census and he was not listed in that. These searches told me he will be found somwewhere in records between 1865 and 1875. I later learned that a target time period is the best way to go, since most prison records are not indexed, nor alphabetized at all. After not finding Samuel Fay in the first record book above, I was looking up information online and ran across more interesting possibilities for research. I e-mailed the Archives and made an appointment to look at another volume and then went in to look at it a week later. What I found there in the online catalog is the register style record book for the Auburn Prison Discharges that covers the 1870's. It covers 10-1-1869 to 9-30-1884, with 46 names per page, and information about each man going across the two facing pages. 132, Samuel Fay, discharged from prison 2-10-1871, county where convicted: Onondaga (the Syracuse area), date convicted 12-26-1866, in sessions court for grand larceny, sentenced to 4 years and 10 months, no trade listed, but he did shoemaking in prison, color: light, age 35, born in Steuben County, NY, has a common school education, height 5' 7 1/2", he had never been in a county or state prison before, discharge was by commuted sentence, by J. T. Hoffman, he is married, his father is living, he has one child, his habits are temperate, he reads and writes, Protestant religion, he was committed by jury and by whom? Right (spelling? maybe Wright? ), unexpired time 8 months and 15 days, condition of pardon: good conduct, health good both when entering and leaving prison, value of articles stolen: $700.00. I also found the two other Fays' discharges in the same book, using the data seen before to find them by date. As I told the attending archivist that I was finished and found the man I was looking for, he said I was fortunate, as many folks dont find them. Within the city of Auburn is located the oldest existing State correctional facility. The corner stone for Auburn Prison was laid in 1816, and it received its first consignment of 53 prisoners in 1817. 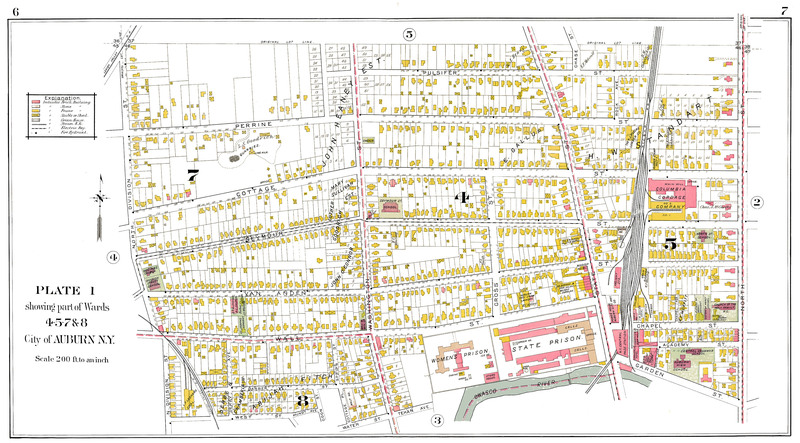 The prison is still open; its name was changed to the Auburn Correctional Facility in 1970. There is a lot of information on the history and significance of the prison available on the internet, but two deserve special mention. The Cayuga Museum of History and Art had an exhibit called Both Sides of the Wall: Auburn & Its Prison. 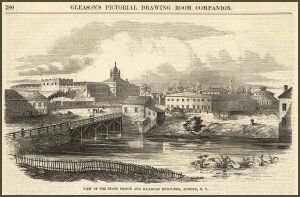 The Museum provided a 16 page brochure about the prison, its history, and the exhibit, and this brochure has been posted by the New York Correction History Society. 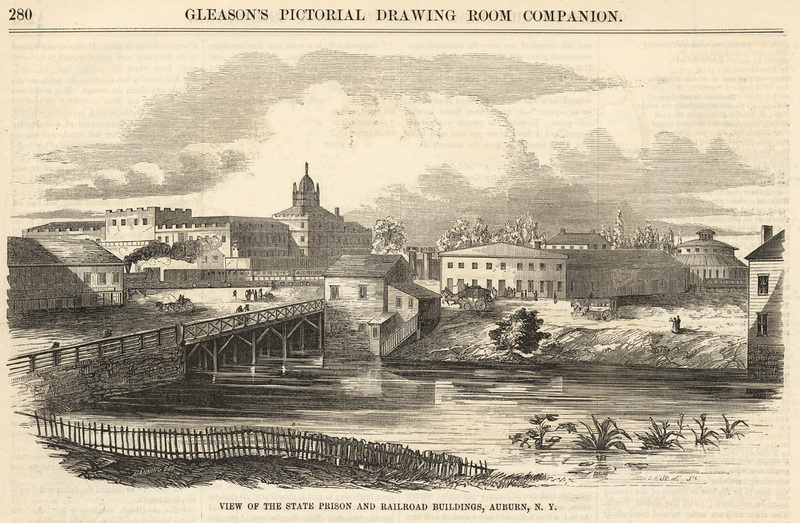 After discussing the history of prisons and punishment in New York, the brochure points to the advantages for the building of a prison at Auburn (water power from the river among the most important), and discusses the use and function of convict labor through the years at Auburn. Convict labor was significant in several areas, including shoemaking, cabinetry, tool making, and woolen mills. Confined in single occupant cells 7' X 7' X 3.5' (an innovation), prisoners were isolated in the hopes of controlling them. Prisoners were required to walk in lockstep; they were forbidden to talk with one another at all. Flogging and solitary confinement were standard punishments. The result of cruel punishments and poor conditions was death and insanity for many of the prisoners. Conditions became so bad by 1839 that there was an investigation of them, and again in 1846; at the latter time, a law was passed against flogging. Other equally "cruel and unusual punishments" such as the 'water shower' were then introduced. Again, deaths followed and further investigations took place. Gradually, changes were made, and "most forms of corporal punishment were eliminated in the late 1800s. In 1900, the dehumanizing lockstep was abolished. The silent system was also gradually discontinued. The rules were slowly relaxed until enforced silence was abolished almost entirely with the establishment of the Mutual Welfare League. The striped uniforms were discontinued in October 1904." (brochure). "The 'Auburn System' included separate confinement of inmates, congregate work during the day, enforced silence, lockstep walking, striped uniforms, and the use of the lash as punishment. It was the first institution to use separate cells for inmates. 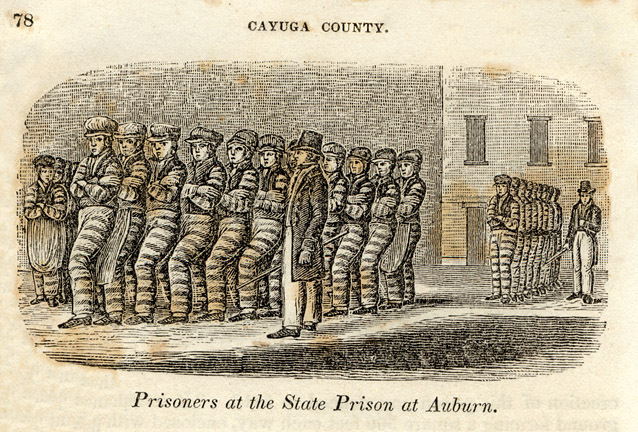 There was great interest in this new system throughout the penal community, and Auburn influenced the subsequent construction of many similar prisons in other states" (New York State Archives). The New York State Lunatic Asylum for Insane Convicts in Auburn is the first such facility designed specifically to house convicted criminals deemed to be insane. Previously, they were detained in prisons or hospitals. The Asylum was opened next to the Auburn Prison in 1855; it was closed and the inmates moved to Matteawan in 1892, and the hospital named Matteawan State Hospital. "In 1893, the State Prison for Women opened at Auburn using the facilities of the Asylum. Women had been previously confined at Auburn from its opening to 1838, when they were transferred to Sing Sing. The new State Prison for Women was the first prison for female felons established in the State. Auburn was utilized for older women who were second-term felons. Auburn coexisted with female reformatories at Albion, Bedford, and Hudson. While separate from the male prison, it still came under the administration of the men's prison. In 1933, the State Prison for Women was transferred to Westfield State Farm and the space was utilized for a greatly expanded industrial facility for the male prison" (New York State Archives) In 1958, the building was torn down and new facilites built for a school for inmates. Important reforms in the management of Auburn Prison were made toward the beginning of the 20th century, with the appointment of Thomas Mott Osborne, son of one of Auburn's most prominent families, by Governor Sulzer as Chairman of a Commission on Prison Reform in 1913. "Osborne wanted to see for himself the conditions under which convicts lived. He arranged to go into Auburn Prison "under cover," entering September 29, 1913 under the name Tom Brown. He stayed for one week, living as a regular inmate. "Osborne came away from that week of incarceration convinced that self government was the practical remedy of the problems plaguing the prison system. He believed that the prison should be treated as a community, and the prisoners should have some say in governing that community. Osborne stressed the value of educating rather than punishing the prisoners. 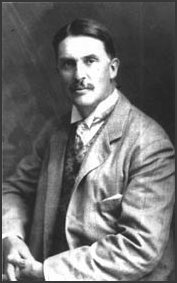 He was the driving force behind the creation of the Mutual Welfare Inmate League, established at Auburn Prison in December 1913"
(photograph and text from the Brochure).